There are many ways to store contact information these days and the two I implement are Google contacts and Apple Address book. I have yet to commit to one or the other for a number of reasons, but the two that seem to be at the top of the list are lack of features in one or the other and offline access. When using Apple address Book if for any reason I don’t have connectivity I can still access all my contacts, yet I have access to Google contacts anywhere I have an internet connection. For the past year or so I have been implementing both, but keeping both databases identical was a hassle. I would enter information into Address Book then every week export those vCards to my desktop and import them into Google contacts. Needless to say this was just another thing on my to do list and rarely was up to date. A friend and I were talking and he informed me of this little option in Address Book that gives you the ability to sync contacts between Address Book and Google contacts. What a novel idea! Many of you may already be aware of this, and I’m not sure when this option was instituted, but it was after my initial inquiries on the subject about a year ago. 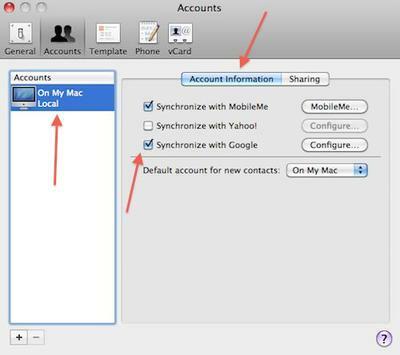 Let’s outline how this is accomplished, and it must be noted if you sync your address book with multiple Macs, use just one to sync with Google contacts. Also you won’t be able to sync contacts from a CardDAV or Exchange 2007 account with Google Contacts. Step 1 Open Address Book and go to preferences, click accounts, choose “On My Mac” and then click account information (shown in Figure 1). 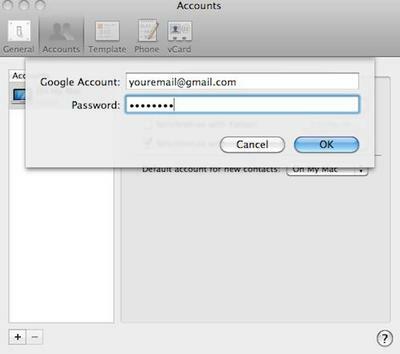 Step 3 Enter your Google account information including password then click ok. Keep in mind you can only sync one Google account (shown in Figure 2). 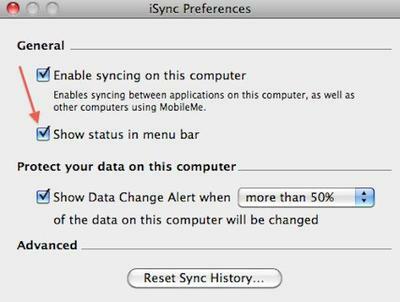 Step 4 Click the Sync icon in your menu bar and choose “Sync Now” (shown in Figure 3) If your sync icon is not already in the menu bar go to Applications>iSync>Preferences and click the radio box next to “Show Status in Menu Bar” (shown in Figure 4). The sync will take place and within a few minutes all your contacts will reside in both Apple Address Book and Google Contacts. This sync initiates once every hour, so if you make changes and want then to show up right away simply perform a manual sync and you will be all set. Just for the record this can also be done with Yahoo!, but I personally use Google, hence the focus on Google contacts. I hope this has been helpful and will make your life easier in relation to managing your contacts. Networking is a very important in this day and age and anything that helps me keep track of all the people I meet and communicate with on a daily basis is a blessing. How do you manage your contact lists? Has it become increasingly difficult over the last few years or has technology made it easier? I want to hear your contact management solution in the comments below as it may help others looking for their optimal solution.